﻿ Is the gold development period of 25G switch coming? At present, the digital transformation tide has arrived, just as the Industrial Revolution has changed the world, greatly improved the production efficiency, digital transformation has become the current trend of attention and development in all walks of life. Enterprises in order to maintain competitiveness in today’s times, Embracing digital transformation, realizing data center modernization through IT transformation, automating productivity and changing the business model, not only improving staff productivity, improving operational efficiency, but also effectively reducing risk and improving profitability, enabling enterprises to win future competitive advantage and opportunities. From the long-term development process, IT architecture speech is divided into three stages, the first stage is the mainframe stage, this stage of the network is a proprietary network, the second stage is server computing, then the server and terminal computing power greatly enhanced, The network began to standardize, but Cisco, Huawei, H3C, Juniper Networks and other manufacturers also exist part of the private agreement, the overall network architecture is very close. The third stage is the cloud computing phase, which is because the last decade with the rapid development of server virtualization, enterprise for the entire IT architecture, the increasing demand for virtualization, and virtual machines frequently need to create the network can automatically and quickly Configuration. At the same time, network security isolation, as well as multiple data center disaster recovery, for the network also put forward higher requirements, so it needs more open network architecture, software and hardware decoupling white box switch emerged. A few years ago, Dell’s network wanted to challenge the status quo with the idea of an open network, breaking the original link between traditional network hardware and software, opening up a new market for network hardware and software, and providing businesses, web and service providers with more choices and more efficient operational capabilities than ever before. But constrained by traditional business needs, white box switch not get a large area of development in the data center market, until the advent of digital transformation, flexible network architecture has become the key to digital transformation, it allows enterprises to quickly respond to changing business and customer demand for “less down, low-cost”. Gartner also points out that hyper-large data centers are increasingly interested in, or have adopted, a box or brand white-box switch. It is expected that as of 2020, such solutions will occupy 22% of the total Data Center Ethernet exchange market, so the white box switch is about to usher in a golden period. In the hardware switch, you can use any third-party network operating system, and can choose to select some of the software inside the network controller or network virtualization inside the control unit, the entire network for further management control, the entire network architecture Is open, which also means that software and hardware are decoupled, that is open network. With the cloud computing, big data, AI and other needs intensified, the need for greater computing performance and transmission speed, some ICT vendor like Dell released with the 14th generation PowerEdge server, native support 25GbE card, compared to 10GbE single-port network speed increased by 2.5 times, With a new generation of storage architecture, will reach an unprecedented speed. With the cloud computing, big data, AI and other needs intensified, the need for greater computing performance and transmission speed, some ICT vendors like Dell released with the 14th generation PowerEdge server, native support 25GbE network card, compared to 10GbE single-port network speed increased by 2.5 times, With a new generation of storage architecture, will reach an unprecedented speed. In the data center, the 25G network will force 10G network abdication, the future from the server side out to the network side is 25G, the backbone network must be 100G, 25G network card for the communications manufacturers is a decade of business opportunities. Why is it so? In this application-driven upgrade process, must be initiated from the server side, this is a rigid demand upgrade, because the 25Gb transceiver with the 10GB switch is not universal, upgrade 25G network card will inevitably upgrade to the 25G switch, the advent of the 25G era, for Dell is indeed a beautiful era, There are many new business opportunities in this. A total cost of ownership (TCO) report, based on ACG studies, shows that an open architecture pod (OAP) has a cumulative TCO of five equivalent to 53% of the cumulative total cost of ownership of tightly bundled pod (TBP). 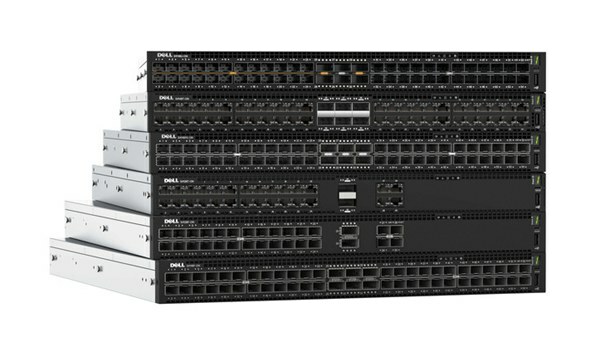 The new S5100-ON series switches match the new Dell 14th generation PowerEdge server with native support for 25GbE. The switch’s 100GbE uplink is designed for 100GbE network connectivity and accelerates network traffic between racks (landscape). It is very suitable for Web 2.0, industry and enterprises and wants to maximize the application and service performance of cloud service providers. The new S4100-on series offers a versatile, rack-top data center open network switch optimized for high density 10GbE fibre/10G copper (10GBASE-T SFP+) or 8G/16G/32G Fibre Channel servers and converged local area network (LAN)/Storage area networks (Sans) in the rack. These switches are equipped with high-performance 100GbE on-line link ports for communication between racks. The Dell S4148U is a new unified switch for Ethernet and Fiber Channel traffic to connect Dell’s industry-leading storage solutions. 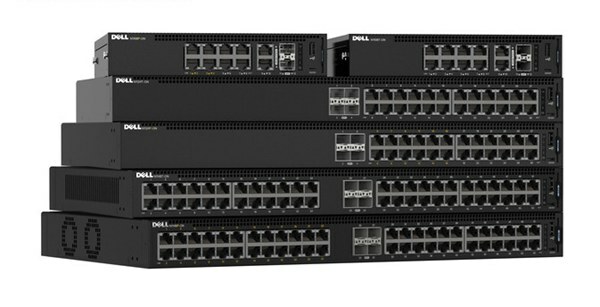 The open network switch continues to break through the upper limit of Fiber Channel connectivity, Dell is the first to support 32Gb Fiber Channel and optimized switches, suitable for further integration LAN / SAN operation of the customer. The S4148U’s unique design allows customers to deploy Ethernet top-of-rack and Fiber Channel switching within the same physical switch, or to further integrate LAN / SAN with Ethernet Fiber Channel. The new Dell N1100-ON series is an energy-efficient, cost-effective series of switches for the campus environment. The series has a series of half-width and full-width options for fanless switches, including Ethernet power supply (POE / POE+) and non-POE version, and from 10/100/1000Mbps to 1 / 10GbE port configuration. The N1100-ON series switches are designed to work with Aerohive’s HiveManager NG, the next generation cloud-based management solution that greatly simplifies end-user wired and wireless access by bringing enterprise-level management to public or private Cloud and set up a new benchmark for network convergence. Open has been Data center network trend, Dell network uphold the concept of openness, leveraging its server and storage advantages, to help users upgrade to 25G network, build a high-speed IT architecture, but in the 25G upgrade times, including Huawei, H3C network manufacturers also eyeing, so Dell network faces many challenges!